Matthew Description "Gathering the Herd" signed by artist Brent Townsend Wild Elk herd in grassy field 35.5 x 18" #213 up for bid. Signed and numbered by artist. Cert included. . From a series of 1000 limited editions up for bid. Would look great framed ! Has never been framed! Stored flat. Mint condition. Signed by artist . Shipped rolled in extra strong 4" wide shipping tube. Flat shipping available, please e-mail for quote. Very large print to ship flat UPS. Rolled available for international only. Thank you! 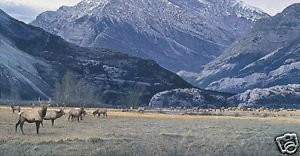 artcoast2coast GATHERING OF THE HERD LIMITED EDITION PRINT Image size: 35 1/2"w x 18 1/2"h. Edition Size:1000 Published from the artist's original work. Retails US: 195.00 Thanks for looking! ent and Shipping Info Payment and Shipping Info We accept Paypal We have been selling artwork as a family owned business for the past 25 years primarily selling wholesale to other galleries. We want you to love your purchase. All items are carefully packaged to insure safe shipment. We carry art from many artists. We are now offering our immense inventory of prints and etchings direct to the public at prices that were once available only to the dealers. Buy it now bids are well below the original issue price or the secondary market price. We also carry many other etching artists including Barbie Tidwell, Stephen Whittle, Alice Morris Scott and Scott FitzGerald. If interested in any of these artists, e-mail to for pricing and photos. We sell below retail and are ready to deal for all you art needs! CD available upon request while supplies lasts! Just e-mail name and address to e-mail address below. Payment due within 3 days ofsale close. See our othersales and 100% positive feedback! Payment due within 3 days ofsale close. . My Othersales • My Feedback • Thanks for looking! Powered by Turbo Lister The free listing tool. List your items fast and easy and manage your active items.